It’s called the Priory, maybe a haven, a refuge, a place to escape the dubious values of the modern world. To value other things, or other…things, under the ever watchful narrowed eyes of the leader of the community, one Charles Erich. The clue to the nature of the place is possibly there at the entrance to this gated community – that strange octopus-like motif on the gates that is repeated elsewhere throughout the Priory, and certainly more than hinted at by a great cover from Ben Baldwin. 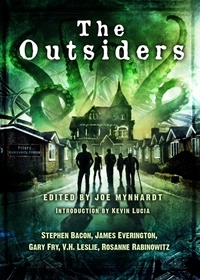 Yes, we are in Lovecraftian territory here, but not in a remote coastal town, rather in the hands of five writers starting with Gary Fry’s “The Subprime” as a virtually friendless, and certainly family-less, young man starts to question the values of his employer and the dubious business practises they use to take advantage of people’s circumstances to maximise their profit which goes to support the Priory. He wants to quit, he wants to leave, but not until after his boss invites him to dinner at his home in the Priory, but what is that strange flesh they are eating and can he really get away? The next story is James Everington’s “Impossible Colours”, perhaps a reference to the colours that some of the characters start to see or the “impossible colour” of the mixed raced community policewoman, facing racial prejudice from the public and even her fellow officers as one man becomes obsessed by the Priory and a desire to escape behind its gates. The themes and characterisation in this story are excellent and it is creepily claustrophobic as we descend into the tunnels beneath the Priory. Stephen Bacon’s “Stolen From The Sea” perhaps echoes themes explored in Stephen King’s recent novel “Revival”, namely how can God, or any god let terrible things happen, especially to the loved ones of believers? And as one man’s faith starts to wane as well as his love for his wife, while his feelings grow for another woman, can he take the ultimate step and leave the Priory? “Precious Things” by V. H. Leslie tells the story of one woman trying to hold on to her husband who is becoming more and more distant, locking himself away in his study, or meeting the leaders of the Priory without her, but what is he doing behind that locked door? Again, like the Everington story, “Precious Things” has a strong lead female character and more creepiness beneath the earth. Finally, Rosanne’s Rabinowitz’s “Meat, Motion and Light” brings a young black law student and wannabe Afropunk musician, back to the Priory to join her mother who has found a way to communicate with the monstrous entity, but years have passed and power is waning, above and below the waves in a story that reminded me slightly of Ray Bradbury’s “The Foghorn” and the movie “Society”. Enjoyable as all of these stories are, what increases the enjoyment of reading “The Outsiders” is the connection between the five tales, as characters and events are referenced in other stories and while all bad things must inevitable come to an end and the Priory has an abandoned feel, gates hanging off the pillars and the leaves swirling in the gutters sounding a lot like whispers, you don’t really want to go in there, do you? 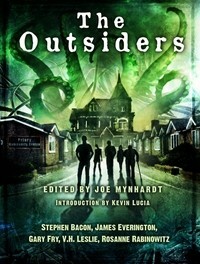 Not unless there is an Outsiders 2, and I hope there is one.